Looking for FREE fun this summer? Enjoy food, crafts, beer, and wine at the 2018 Levitt AMP Ocala Music Series. 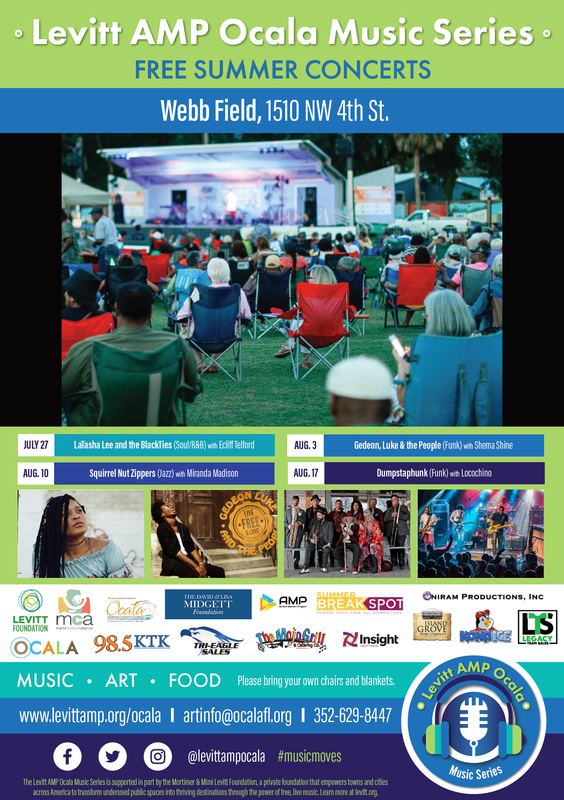 The Levitt AMP Ocala Music Series will take place at Webb Field at the Martin Luther King, Jr. Recreation Complex located at 1510 NW Fourth St. Check dates for upcoming Concerts. The Summer Break Spot will provide free dinners for those ages 18 and under. City officials said the concerts will have an open lawn setting and that, the public is invited to bring blankets and lawn chairs to the concerts. Gates open at 6 p.m. and admission is free. The 2018 Levitt AMP Ocala Music Series will feature a diverse lineup of high-caliber talent spanning musical genres such as blues, jazz, funk, soul, gypsy swing, Latin, roots/Americana and R&B. The series is sponsored in part by the Mortimer & Mimi Levitt Foundation, a national funder of creative placemaking that empowers communities to inject new life into underused public spaces. Gates open at 6 p.m. and admission is free. For more information, visit concerts.levittamp.org/ocala. To learn more about vendor or sponsorship opportunities, please contact Jennifer Normoyle, City of Ocala Cultural Arts Coordinator at jnormoyle@ocalafl.org or 352-629-8220.